Maybe the presumptions about the shape of the Island have their roots in Libanius' gushing description of the Island as being surrounded by its wall "like a crown". Much as one tries to resist it this comment evokes images of a round shape for the Island. Certainly it wasn't square, but what type of perspective could Libanius have had of the Island (short of climbing to the top of Mount Silpius to give him an all-embracing view of the Island). We suspect the "crown" analogy is merely that... an allusion. If one discards the "round" Island thesis then one can start to move away from the Wilber interpretation of how the Island was shaped in antiquity. The map below shows Wilber's speculation. What is the matter with this interpretation? Well, geographical reality and the forces of nature are two good places to start. The Island either had two forms: Wilber's kidney shaped version or a more elongated island as Uggeri suggests. On the basis of what I know of geography/topography the elongated form makes more sense if one perceives that the Orontes is a "strong" river rather than a weak one. There is no evidence to support a meandering Orontes either historically or in modern times. The faster a river is the more likely it is to be straighter (and its parts where it divides straighter). The Wilber version relies upon a very lazy Orontes indeed to create a river as he portrays it. 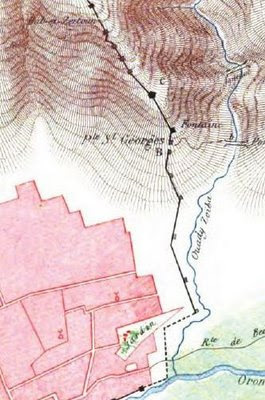 In fact looking at his map the "branch" of the Orontes is the part to the west while the easternmost course (now silted up) is the main course of the river. The Orontes is a river with dramatic seasonal differences. Nowadays it is very low indeed in the summer due to the water being siphoned off upstream by the Lebanese and the Syrians that control the headwaters. In a paper, The Geopolitics of Water by Paul Michael Wihbey and Ilan Berman, the authors comment on the current flow situation of the river: "According to Turkish estimates, Syria utilizes 90 percent of total Orontes flow (which averages 1.2 billion meters annually at the Turkish-Syrian border), allowing only a meager 10 percent to pass into Turkey. Furthermore, Syrian proposals to create two additional reservoirs along the river threaten to reduce Orontes flow to Turkey even further. In effect, Syria has used its control over Orontes water as a weapon, seriously eroding the agricultural and economic situation in Turkish Hatay". In the winter and spring the river still carries sizable volumes of water from the heavy (and notoriously so) rainfall in the lower reaches of the Orontes valley. Thus high water is still achieved in these seasons. The flow rate of the river averages 5.04 m/sec with an annual flow of 2900 billion m3. One can merely speculate upon the effect that the drainage of the Lake of Antioch (upstream where the valley widens out) in the post-WW2 era. Such a lake usually has the effect of storing water and slowing the flows. This massive wetlands area was eliminated to foster the cultivation of cotton with rather dire natural effects upon birdlife and the famous flow of eels up the river. In any case the Orontes was a strong river in Antiquity. Thus there is no reason to surmise that the Island was the shape that Wilber gave it, particularly as no exploration has been done at the northern "end" of the Island to delineate its extent. Uggeri's version, as we noted elsewhere, has a very interesting spin. He has the Island very elongated, with the rationale for the western side of Theodosian wall being as straight as it was being due to it running along the river bank for most of its western side. One does not need to be steeped in geography to see that this makes more sense with a "strong" river in a largely alluvial plain. This has various implications. We know that the Island had five bridges connecting it to the "mainland" part of the city. Only one of these (that at the Dog Gate) has been identified. These bridges in the Uggeri context (though he only shows one) would be far more spread out than the bunched group of bridges that Wilber hypothesises. The Island with Uggeri's form allows the Regia to be near the Old Seleucid Town and yet still be on the Island which Wilber's plan made difficult to conceive. The Uggeri plan almost makes both branches have roughly equal weighting, a true division of the river. As one silted up (maybe due to debris from the earthquakes e.g. collapsed bridges) the remaining branch would have had to move twice as much water, thus becoming wider and more powerful (and more erosive). Finally we might speculate that the Duke's Gate (the Porta Ducis) at the time of the Crusades might have been a very long-established gate/bridge indeed, whereas it did not make much sense in the context of the Wilber plan. We discussed the Regia in some length previously. The further thoughts have recently come to mind in light of our discovery of the Uggeri map and his view of the city's topography. We compare Uggeri to Wilber in another commentary. As we noted there Uggeri has the former branch of the Orontes, that created the Island as a separate quarter, running along the Theodosian Wall. It had never seemed clear to us why Wilber's map had the Theodosian Wall cutting the old Seleucid city in half and leaving the Regia and Agora seemingly outside the reduced city. However, if we take it that the new wall was built along the watercourse, as would seem natural, then there is a rationale for the Uggeri version. While Uggeri does not show the Regia on his map he does speculate in the text that the so-called Byzantine stadium that was uncovered in the 1930s on the Island was connected in some way to the Regia. While this clashes with our previously stated suspicion that the Regia was in the Seleucid city (correspondeing with the Casianus Church and the legal complex). Maybe, as we speculated before, the palace of justice was somehow distinct from the Royal Palace (Regia). This would allow the possibility that the Regia was built on the Island and yet in relative proximity to the "old" city due to the Island being elongated, as per Uggeri, rather than roundish in shape as Wilber drew. We suspect the latter was due to Libanius' suggestion of the Island being round in shape with its wall surrounding it like a crown. This may have just been artistic license. The Hungarian map (for which we still do not have a source beyond the Hungarian posting on Antioch in Wikipedia) shows a Regi Templom in the same general area as Uggeri speaks of the Regia being. However, the rationale behind this remains unknown. Giovanni Uggeri, born 1939, is (was?) an academic at the University of Rome with a specialty in ancient topography. He is (was?) the editor of the Italian language Journal of Ancient Topography. I use the is/was idiom as all emails to his Rome university website bounce back even though he was shown as still running courses last year at the Rome university. in the southern wall, Uggeri shows both the Golden Gate (Porta Aurea) and the Rhodion Gate, which I have recently discussed elsewhere. he shows the Mese Pyle (Middle Gate) above the Forum of Valens. In his text he refers to this as leading up the valley of the Parmenios as an alternative route to Apamea. he shows another silted up course of the river running through the middle of the Island cutting off the Hippodrome, palace and temple from other parts of the Island. Where he came up with this idea is not mentioned in the text of his article. he adds an extra bridge to the Island. This bridge heads off the Island to the north crossing the main branch of the Orontes. On the far side it connects with the road to Alexandria ad Issum. The bridge is aligned with the right side of the Hippodrome (and thus coincides with Poccardi's thoughts) and aligns also with the Dog Gate and its bridge in connecting with the main part of the city. This seems to make sense but I have seen no evidence for it in any text and neither is there any archeological evidence for it. he clearly shows the Bridge Gate under its alternative name of the Porta Philonauta, in line with the evidence from Malalas. he sites the "emporio" or river port at the mouth of the Phyrminos. This port become virtually redundant when the river became unnavigable in early Roman days. Love it or hate it, the Uggeri map is a thought-provoking challenge to the Wilber plan that had already been debunked in part (where it relates to the Island) by Poccardi. The Mese Pyle (or Middle Gate) was a gate that stood above the Forum of Valens. It was reputedly built by Trajan, though this may have been a reconstruction. Maurice Sartre describes it as an "architectural arch" but there is some evidence to suggest that the city had a wall running along the mountain above the city but not at the mountain ridge (such as the later Theodosian Wall did). Thus a wall ran parallel to the Colonnaded Street but only a few blocks to the east of the main street. In which case this would have been a genuine city gate. Downey also calls it a monumental arch. Uggeri speculates that this gate led to a rugged route up the valley of the Parmenios river and over the ridge (before the building of the Iron Gate dam made the route impassable). This led to Apamea by a more direct, but much more topographically challenged, route than that which went out the Beroea Gate and followed the Orontes to Apamea the long way. The Mese Pyle has not been found and there are very few mentions of it in historical texts. One of these references though is from Malalas who records that it was adorned with a statue grouping of the Wolf & Twins (which also decorated the Beroea Gate according to the same source). Morey states that the Middle Gate was near the Temple of Ares, but does not say what source attested to that comment. The gate that was later called that of St.George was apparently the old Rhodion Gate. This gate would have been named after the quarter of the city where the Rhodian contingent of immigrants were settled by the early Seleucid rulers. This zone either corresponded to the Kerateion quarter (in reality the Jewish quarter) or was even more elevated than the Jewish district. Boucher in his Short History of Antioch refers to the origins of the Rhodion name as being with a "rose garden" rather than any settler history. "Imperator ¡taque jussit, uti aedificia etiam quae extra urbem posita erant muro cingerentur : murus ¡taque factus est, a Philonauta quam vocant Porta Rhodionem usque dictum locum.."
We can merely speculate on why the old Golden Gate ceased to function as the main point of egress to the south. Maybe the bridge over the Phyrminus opposite the main gate was no longer usable. Maybe the higher gate was easier to defend. As the Rey map shows the St George's Gate was certainly rather distant from the village that Antakya had become by the time of his survey. In any case, this adds another gate to the list of the those in the city walls. A great colonnaded street, a Via Triumphalis, was not a rarity in Roman cities. Ironically, the city that most conspicuously did NOT have one was Rome. There the streetscape was more one of interconnected open-spaces, plazas, forums and enclosed porticos that sprawled across the level parts of the city. Antioch had its great colonnaded street (and various other colonnaded thoroughfares of minor import) as did Alexandria and Constantinople and lesser cities such as Apamea and Palmyra in the general vicinity and other places as far flung as Lepcis Magna and Ephesus. The chief work which discusses the colonnaded street of Antioch is the belated review (Les Portiques d'Antioche) by Jean Lassus of the excavations along at the street during the 1930s. This he wrote up in the 1970s rom notes and recollections and it remains the definitive work. Curiously the street still underlies the main throughfare heading out of modern Antakya in the direction of the northeast. 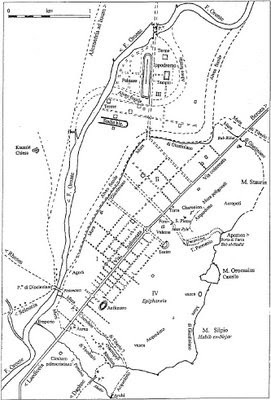 However as the Lassus volume shows the direction may remain the same but the intervening millenia have buried the foundations of the first street in some places (in the oldest part of Antakya) at over 11 metres (33 feet) beneath the modern route. The greatest difficulty that Lassus came across was this fact that the route was overlaid by a busy thoroughfare. It was only at the margins that he could dig in some sites and the best luck he had was when some major roadworks resulted in a temporary devaition which allowed the momentous discovery of the point where the Parmenios was channelled under the main avenue and presumably the Forum of Valens. The colonnaded street was three thousand four hundred metres long and was collectively a work of various emperors and benefactors. Most commonly attributed the credit for the first conversion of the route to its monumental status is Herod the Great. Scholars have speculated as to why he should have been so keen to make this massive expenditure for the paving and the construction of the colonnades of a city which he did not rule. The colonnade did not run through the then centre of the Seleucid city but rather skirted the walls and ran through the Epiphania extension of the city connecting the southern Daphnetic Gate to the Beroea Gate at the northern end of the city. In the middle of its length the street angled slightly which resulted in there not being an uninterrupted vista from one end to the other. This may have been forced by the presence of the Parmenios crossing or may have been a visual effect to ensure that the vista was not too long and ultimately unimpressive. Both the Mese in Constantinople and the colonnaded street in Palmyra had at least one angle which allowed the positioning of important structures or open spaces/complexes. Haussmann would have approved. We deal with some of the layout issues of the city in the chapters on the Street Layout of the city and the Forum of "Valens" zone. The colonnaded street had various iterations. Of course, it was under permanent maintenance over the eight centuries when it was most central to the city's urban fabric but it did have major revisions which are attributed to Herod, Tiberius, Antoninus Pius and Justianian. The latter two rebuilds were as a result of earthquake damage and resulted in the level of the street being raised substantially upward. Lassus holds the view, from his excavations, that the street had its apogee after the Antonine rebuild and at that time it consisted of a 9 metre wide roadway with 9 metre wide porticos on either side. This gives a rather impressive thoroughfare with nearly 100 feet of width. The colonnades were illuminated at night according to Libanius and thronged with people until very late. Lassus also notes that there were formalised stores facing into the porticos, at least in the main Epiphania commercial district. These were 6 metres deep. There may also have been tradespeople vending in the porticos from less formal stalls. Below can be seen a cross-section from Lassus's work. Below can be seen a schematic from Lassus' seminal work Les Portiques d'Antioche. He undertook a variety of digs along the street. The most significant being at the Parmenios crossing and at the Savonerrie. This latter was a soap factory in the 1930s but ironically is now the most upscale hotel in Antakya. The owner at the time graciously let Lassus' team dig up the extensive courtyard facing the road to get access to the ruins. 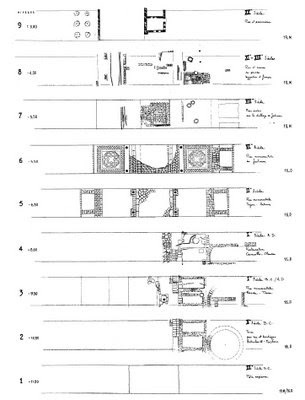 Here we see the nine layers that Lassus identified at this point the lowest being 11.2 metres below the street level of the 1930s. The diagram is best enlarged by double-clicking it to improve details. The heyday of the street was Level 5 in the Antonine period. A key thing to note is that the modern day street in Level 9 now lies over the side aisle of the original street in its heyday. Through a process of encroachment (which many have noted as being a common degeneration of former streets in the Roman East from their original width into the narrow souq format of the last thousand years) the original street was built over and much restricted in width. This process began after the final restoration of the colonnades by Justinian in the 6th century. Some feel that the street may have had plazas or tetrapylons or combinations thereof at its junctions. Lassus speculates that these may have only been at the most important junctions. Below can be seen the "Rondpoint" unearthed by Lassus under the Habib al Nejjar mosque. As we noted in the Street Layout article the Hippodamian plan of the city was on a per strigas basis with the narrow ends of the blocks facing the main street with the long sides facing the side streets. 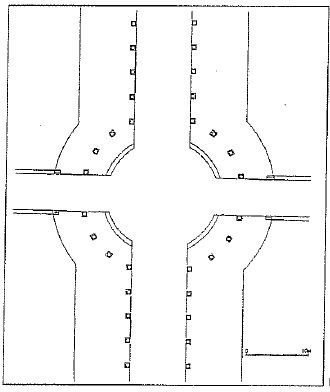 This means that there would have been a very large number of junctions along the colonnaded street. It could be imagined as somewhat akin to the street pattern of Fifth Avenue in New York today. There was reputedly a large plaza where a statue of Tiberius was set up on a column. There was also a plaza where the omphalos stood (though some put this on the Island). In some versions the Nymphaeum also stood at a major junction. Whether this stood in the middle of the street or framed the view up an avenue coming from the Island is not established. While not a single full column, base or capital was discovered, some column drums were unearthed. 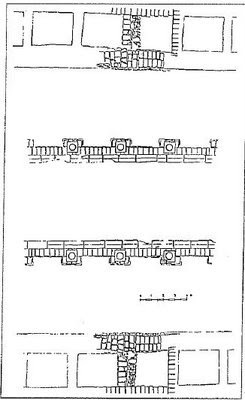 These evidenced that the columns were 58cms to 65cms in diameter, indicating a full height of around 6 metres (before capitals, cornices,architraves etc). On the scale of things this is quite substantially less than the 9 metre columns of the Palmyrene colonnade, however, as Lassus points out (from the evidence of the spacing), the Antioch colonnade would have had an enormous requirement in stonework with around 700 columns on each side of the street giving a total of 1,400 columns, minus some deductions for street junctions and other gaps in the colonnade. A pending issues is how important structures along the street were dealt with. Did the street open out into the Forum of Valens or did it skirt along the edge? Did it become a one-sided colonnade when it got to the forum? In other places it must have had major public buildings placed along it (possibly the Bouleterion and temples) and so did the colonnade break in front of these or was it an unbroken line of columns for all its length? Much remains to be answered. The frustration that Lassus felt is palpable in his review written for ANRW. He was on the verge of tying the street to the Forum of Valens at the Parmenios tunnel excavation when political factors forced the end of the dig. As he notes, despite all the cross-sections the team made, not one encountered a street junction with the transversal streets.This was somewhat understandable as the excavations were limited in size and the "narrow" ends of the blocks were a sizeable 58 metres. Thus it was easy to "miss" a junction. This left unanswered issues as to the side streets' width and how the colonnade dealt with these "interruptions". Even worse, in his view, was not finding any of the major streets that crossed the colonnade. They had been almost certain before beginning the Parmenios dig that this was the place where the main avenue to the Island intersected and yet no trace was found. We have come to the conclusion that, despite the greater size of the Jewish community in Alexandria, there seemed to be a greater affinity between the Diaspora in Antioch and that in Jerusalem than existed with the Diaspora in the Egyptian capital. Maybe we are wrong. We shall deal elsewhere with the nature of the Jewish community at Antioch as there are several good texts on the subject. The object of this commentary is the Maccabean connection to Antioch. This is linked over the centuries to the worship/commemoration of the martyrs of the Maccabean Uprising most specifically the woman, supposedly Ashmûnît, and her seven sons. "In this city there is a fine building , which the people, after their (conversion to) faith in Christ, changed into a church bearing the name of the Lady Saint Ashmûnît. This place had been called a house of prayer of the Jews. It is near the summit of the mountain, on the western side. It is built on arcades, and beneath it there are tombs , among which is a hidden treasure-chamber to which one descends by means of a stairway. Herein is the tomb of Ezra the priest; and the tomb of Ashmûnît, and her seven sons whom King Aghâbiyûs put to death on account of their faith in God – He is great and mighty! And they are buried in this treasure-chamber. It also contains the mantle of Moses the prophet, and the staff of Joshua, the son of Nun, with which he divided the River Jordan; also the fragments of the Tables (of the Law). And still lower beneath this building there is another treasure-chamber in which is the knife with which Jephthah killed (his daughter) in sacrifice to God; also the keys to the Ark of the Covenant, with the purified and sanctified implements, hidden away, known to nobody." In the great Byzantine tradition, the structure was a veritable trove of religious bric a brac. The topic of this tomb/synagogue/church/shrine is dealt with in a handful of articles over the years (most recently by Lothar Triebel in his article "Die angebliche Synagoge der makkabäischen Märtyrer in Antiochia am Orontes". and more distantly by Cardinal Rampolla del Tindaro in his work "Del luogo del matirio e del sepulcro dei Maccabei"). I have also recently surveyed the Julian Obermann article (Journal of Biblical Literature, Vol 50, No 4 - 1931 - pp 250-265) . It should be noted that this was written in 1931 without access to the Stinespring translation (which ironically was being produced at almost the same time). Obermann makes some excellent observations and brings into play an Arabic version (by Ibn Schahin) of the Rabbinical texts. He notes that the Maccabean martyrs were the only example of Jewish "saints" being drafted into the Christian hagiosphere. And in Antioch it was not merely the concept but the physical "site" that was transformed from a tomb to a synagogue and eventually to a church. There has also been some discussion as to where exactly the martyrdom and burials took place with Jerusalem also potentially staking a claim to the event. In any case, Antioch had its "Maccabean" shrine and claimed great antiquity to its relics. Interestingly he notes that Rabbinical sources downplay the siting of the synagogue in Antioch on the site of the tomb as this circumstance would fly in the face of prohibitions against corpses or graves at the site of worship, a scruple that Christians did not indulge. In the way of explanation, Obermann goes on to elucidate the issue of the name of the mother of the martyrs. She is referred to in the Vatican text as Ashmûnît. This he contends is really "Hasmonith" and this is a manifestation of the much more used term Hasmonean in reference to the period of the uprising. Other versions of her name include Shamuni, Salomona, Salomonis or Samona. "And there was built upon them (viz. upon the martyred brothers and their mother) an eightfold synagogue." He relates that 1. Maccabees records that Simon Maccabaeus erected a memorial on the sepulchre of his family setting up seven pyramids one against another, for his father and his mother and four brethren. Over time this morphed into a shrine/synagogue eventually being coopted into a church function (and later, by some reports, the "relics of the saints" were transferred to Constantinople where holy body parts were a favorite of the hoi polloi and the great and good. It seems this shrine was in the Kerataion or Rhodion districts near to the southern wall. This prompts us to wonder about why any tombs would be allowed inside the city walls, this not being standard practice. Then again the wall may not have extended that far up the slopes and these barrios may have been ex urbs at that time. The fact that it was built on arcades probably relates to it being on one of the steeper urbanised parts of Mt Silpius. On the 18th of May 1268 the Crusader period of Antioch came to a devastating end and the city faded into an insignificant village over the next 650 years. The Sultan Baibars achieved this victory and his exulting letter to the count of Tripoli, describing his sack of Antioch, still exists in its original Arabic, and was published by Joseph Toussaint Reinaud (the French orientalist - December 4, 1795 - May 14, 1867) in Histoire des Guerres sous Bibar, in Journ. Asiat - July & Aug. 1827. Libanius in his Antiochikos makes reference to the avenues on the Island stretching out from their point of convergence like "the four-handed Apollo". This is a curious comment and I would welcome thoughts on where the concept of an Apollo going beyond ambidextrous may have come from. The point at which these avenues converged was thought to be the Tetrapylon of the Elephants, which we have discussed elsewhere. However, in the 1930s, the excavators where intent upon discovering another Apollonian convergence. This was the famed Omphalos (or navel) of the city which according to Evagrius was at the point at which the Colonnaded Street met the main avenue to the Island (thus somewhere near the Forum of Valens). Stinespring's translation of the Vatican text in Arabic states: "There is in the city a place called el-Umsilbah (ο ομπηαλοσ), the explanation of which is "the middle of the city"; and an idol is there; whenever a thief or rogue bestirs himself in the city, that idol cries out with a loud cry which is heard in the farthest limits of the city." The latter part repeats the superstitious ramblings for which the Arab author is notorious. I was recently perusing some Seleucid coinage and came upon the image (below) of Apollo seated upon the Omphalos as supposedly was the statue situated at the Omphalos. There is a bow to Apollo's side and he is holding an arrow pointed downwards.